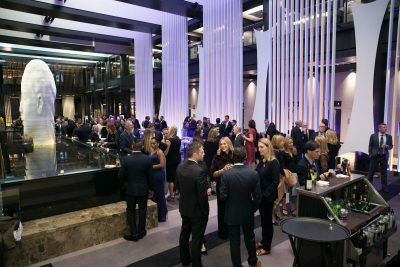 On Tuesday, November 14th, the Orthopaedic Foundation, a non-profit medical research foundation invested in research and education in the field of orthopaedics and sports medicine, hosted their 13th Annual Gala at the Grand Hyatt in New York City. Chefs Kevin Reardon, Michel Nischan and pastry chef Natalie Whelan prepared a 4-course meal with bone healthy ingredients that were paired with outstanding California and New Zealand wines. Among the honorees, presented the “Leadership, Vision, & Inspiration” award, was Greg Boester, managing director at J.P Morgan Chase, also known as a former Olympic Ski Jumper. As well as, Ken Wisdom who was granted the “Philanthropic & Professional Excellence Award” for his work as an avid athlete, philanthropist and managing director at Portfolio Advisors. The event also offered a fantastic opportunity to watch mentalist and America’s Got Talent finalist, Oz Pearlman, perform and vow guests with his unbelievable talent in a magic show in which the audience was included. This was a fantastic evening for all those who participated that helped raise funds successfully for research and education in the field. The Orthopaedic Foundation was created as a not-for-profit (501) C (3) organization whose primary function is to effectively promote, support, develop and encourage research and education concerning minimally invasive orthopaedic surgery and advancements in musculoskeletal diseases. The Foundation is additionally committed to initiatives that educate individuals of all ages who are passionate about a healthy and active lifestyle and engage in self-directed practices to maintain that lifestyle. The aim of the Foundation is to discover new modalities for the treatment of orthopaedic injuries and musculoskeletal disease, to promote injury prevention, and to explore minimally invasive treatments that guarantee shorter recovery time and faster return to daily activities.